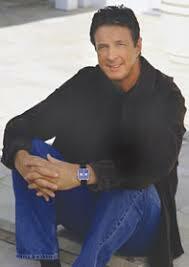 Michael CRICHTON ? I'm fan ! Yes I'am fan, a true fan of this very able colleague, a physician like me. My great regard for Michael is based upon his gifts. 1. Michael has been an american student working hard for the obtaining of his MD (1969, Harvard). In the bargain, Michael is a very attractive boy. 2. I am full of admiration for Michael because he has ben able to charm his readers with real or imaginary scientific narratives. For example a novel as "Jurassic Park" was appearing as true as true... So Jurassic Park, as a book (1992) and as a film (1993), was a Crichton's bestseller. Timeline (1999) is a novel where Yale and Dordogne are mixed with astonishing daring ! of scientific opinions which are generating a great deal of questions. 3. Michael Crichton has taken my fancy at once. And by Net I was no surprised when I was meeting numerous scientific men having relations with him. Michael is a very skill man because he is holding multiples informations. And he is very pleasant to read. in the "politically correct way"; but after that he was heard with serious. MIT etc... He was creator of ER for television, etc... In 2002 a ankylosaur was named Crichtonsaurus bohlini ! falls... So the man power is a lilliputian thing ! Young ! Let's go ! Let's believe in us ! Micheal is an exemplary man who is a possible model. Young, have you read Next (2006) about genetics and law ?